The longest double header in Major League history was played on 31 May 1964 at Shea Stadium. The Giants defeated the Mets 5-3 in the first game of the day. Pitcher Gaylord Perry then led San Francisco to another victory in the second game, pitching ten innings in relief as the Giants won 8-6 in twenty-three innings. The second game lasted seven hours, twenty-three minutes, and the two games combined lasted nine hours, fifty-two minutes. During the second game, the Mets turned a rare triple play in the fourteenth inning, and Gaylord Perry supposedly threw his first spitball in a Major League game. Boston Beaneaters’ second baseman Bob Lowe became the first Major League ballplayer to hit four home runs in one game. On 30 May 1894, Lowe went 0-for-6 in the first game of a doubleheader against Cincinnati, only to follow it up with his four round-trippers in the second game, two of which were hit in the third inning. Boston defeated the Reds 20-11 in that game. When Kinect Star Wars for Xbox 360 was released this past April, Dodgers fans had the opportunity to see Darth Vader himself throw the first pitch as part of a promotional gag in Los Angeles. It seems that the Force is not as strong with Vader as it once was, but I suppose one should expect that falling to the Dark Side would inevitably stunt one’s ability to play baseball. During an 8-1 victory against the White Sox on 26 May 1925, Detroit Tigers’ outfielder Ty Cobb accumulated his 1,000th extra-base hit, making him the first player in major league history to do so. Prior to this season, the record had been held by Honus Wagner, with 993 extra-base hits. Cobb would finish his career with 1,139. A couple days ago, I sat down and read Stephen King’s novella, Blockade Billy. As a baseball fan and a Stephen King fan, I don’t know how I managed to not hear about this book for so long, but a few weeks ago, I stumbled upon a review and knew that I had to check it out. Very briefly, it is a story about a young, rookie catcher, William Blakely, as told by New Jersey Titans third base coach, Granny Grantham. Billy is small in stature and a bit slow in the head, but he’s also a phenomenal ballplayer, whose willingness to stand in the way of any baserunner coming down the third base line earns him the nickname “Blockade Billy.” Keep in mind, however, that the writer of this tale is Stephen King, not W. P. Kinsella. I won’t give away the ending, but I will say that it was precisely the kind of twist that one would expect from the author. It’s not quite as graphic as some of King’s other writing, but his trademark style and voice definitely shine through. That being said, this obviously isn’t meant to be a bedtime story for the kiddos as they get tucked into bed tonight. It does make for an interesting bedtime story for a grown-up, however, as the story is so short, I’m not sure it even qualifies as a “novella.” Even with large print, the book is only 125 pages long, and I was so caught up in the story, it seemed even shorter than that. If you’re looking for a short, entertaining-but-blood-chilling read, I’d definitely recommend Blockade Billy. 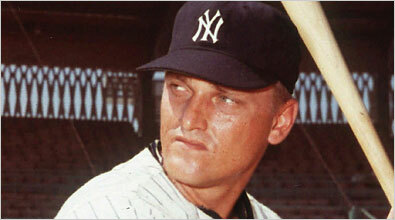 In a game against the Angels on 22 May 1962, Yankees slugger Roger Maris set a Major League record by drawing four intentional walks. Each walk was granted to Maris by a different Angels pitcher as the Yankees won 2-1 in twelve innings at Yankee Stadium. I can’t say I blame the Angels. This was, after all, the season immediately following Maris’s success in breaking Babe Ruth’s single-season home run record.